Economic reform: A historical perspective and its social impact; The changes in China’s employment relations; Labour disputes; Trade unions; Labour contracts; Labour tripartism; Labour dispute arbitration; Labour litigation; Conclusions. The scale, nature and causes of labour disputes in China are identified and discussed in this comprehensive review as well as how they can be managed. 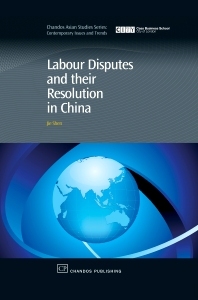 The labour disputes resolution mechanisms discussed in this book include, trade union, collective labour contract, tripartite coordination and labour court. This book presents an updated literature review and reports the findings of two empirical projects on this subject. The effectiveness of these mechanisms and the appropriate resolution model for the future are both discussed. Dr Jie Shen graduated from Yangzhou University (BA) and Jilin University (MA), People's Republic of China. He was awarded a MBA from Oxford Brookes University in 1999 and a PhD from Brunel University, London in 2002. He then took up a post as a Research Fellow at the University of Manchester Institute of Science and Technology (UMIST), undertaking research projects in HRM in the British National Health Service. In 2004 Jie Shen was appointed Lecturer in HRM at the University of South Australia. He is also a visiting professor at Shanghai University and Fujiang Normal University, China. He has published widely in the fields of International HRM, HRM and Organizational Behaviour.